Quick and delicious, this pasta recipe will be ready before you can say presto! 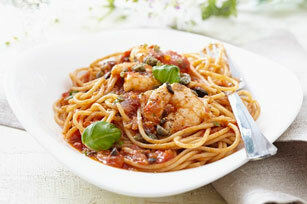 Made with ripe tomatoes, succulent shrimp, savoury Parmesan and salty capers, this recipe is the perfect combo for pasta night! Heat dressing in large skillet on medium-high heat; add onions and tomatoes; cook 2 min. Add shrimp and cook 4 min. or until shrimp turn pink, turning after 2 min. Add drained pasta, sauce, Parmesan and capers. Cook 2 min. or until heated through. Sprinkle with 1/2 cup fresh chopped basil or parsley before serving.